If you’re looking for some affordable, but high-quality walkie talkies that have a nice range and crisp, clear sounds then you might want to consider these ones from Motorola. Read our buying guide packed with information to help you decide if they’re the right 2-way radios for you. Are you setting a camp out or hiking with your friends or loved ones? Be sure to equip yourself with all the must-haves to face every emergency you encounter along the road, out in the forest or anywhere outdoors. A perfect companion for you is the Motorola Two-Way Radio set. 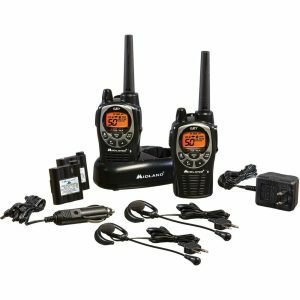 This comes in a set of two radios that both guarantee clear and constant communication with your travel companion. Even if you accidentally lose your camping or mountaineering partner, you won’t have any worry with a radio unit with you. If you have a workplace or company that covers a large area such as a factory, or in the outdoors then you may want to consider these 2-way radios from Motorola. Sure, you can use phones to stay in touch, but radios have a number of advantages: they’re free, come with extra features like weather alerts, and you can communicate with your entire team at the touch of a button. If you are not the techie type and you hate complicated selections from the menu, then, the Motorola Two-Way Radio is for you. And for this very affordable price, you can already make sure of your satisfaction when communicating outdoors. It’s lightweight, portable and easy to bring just about anywhere. If you leave home with full battery, you can ensure seamless communication all day. It doesn’t matter too, if the weather is not too friendly. This two-way radio set has 11 different weather channels. Seriously, Motorola radios have some of longest battery duration of any brands on the market today. Or, check out this list of the Top 5 Walkie Talkies to consider. What Do People Think About this Communications Device? Motorola: The Perfect Walkie Talkies? Whether you are a newlywed couple on a honeymoon or best friends on an outdoor escapade, the Motorola 2-Way Radio is for you. This product is so perfect for any outdoor activity for two! Whether it is a camping, boating, mountain-climbing or hiking you are into, these walkie talkies will help you stay connected to your companion though you are miles apart. Yes, you read it right! Even if you and your outdoors partner are miles and miles apart, you can still find each other because the Motorola Two Way Radio set has a 23-mile range. Of course, it does get reduced when there are things like trees or buildings, but overall? It’s quite impressive. It is so convenient to bring the Motorola 2-Way Radio anytime, anywhere you go. With a light weight of just one pound, you won’t encounter any discomfort at all. Because of the powerful range this pair of walkie talkies covers, you don’t need to be in an outdoor escapade to enjoy using the devices. In fact, you and your best friend can keep each of the devices as your means of communication. If you two live within the 23-mile range it will be fun to use the radios for your conversations. There are over a hundred privacy codes you can use so no one can understand what you’re talking about even if by chance, they capture the frequency you’re using. What are your thoughts about this popular 2-way radio? Leave a comment below and let us know what you think. Jackie Bolen is a lover of all things tech and home security. She loves to try out ALL the spy gear and gadgets, video doorbells, surveillance cameras and more to help you find the best one for your needs.